Trailmaster Challenger 300SSide-Door Nets - Adjustable Steering Wheel - 4pt Safety Harness - FREE SHIPPING - Calif Legal -Bigger Engine!! BMS Avenger EGL X-22 UTV-Youth Model - Calif Legal- Upgraded Suspension - Upgraded Carb - Auto+Reverse, w/ Windshield & Roof Lights & Full Doors - FREE Goggles, Gloves & Gear Bag - FREE SHIPPING - NEW SUPER SALE PRICE! Kymoto Avenger Max 170 UTV - NEW Larger Model with Windshield -Oversize 22" Tires + Alloy Rims, - Upgraded Suspension - Top Cover - Auto + Reverse - EXTENDED MODEL! FREE SHIPPING! 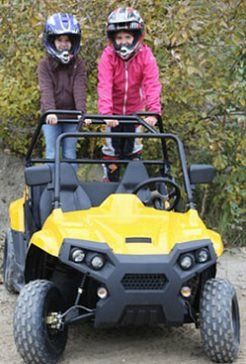 Gas Golf Cart UTV Hybrid 200 Side by Side With Custom Rims/Tires - 2 or 4 Seat Models -McPherson Strut Suspension - Large Adult Size! Free Shipping!